Download "Calling Features. Connected. Instructional Manual. Your pathway to the world"
2 Call Waiting Allows you to never have to miss another call while you are on the phone. With Call Waiting, beep alerts you to another incoming call. If you don t answer the first beep, you ll hear another one in ten seconds. How to use Call Waiting: 1. A short beep in your earpiece while you are in the middle of a call...means that someone else is trying to reach your number. 2. If you wish to end the first conversation and begin the second, just hang up. Your telephone will immediately ring with the second call. 3. If you wish to answer the second call without ending the first, ask the first caller if you may put them on hold... then press and release the hook switch. The first caller will be put on hold while you talk to the second call. 4. To return to the first call, press the hookswitch. You can alternate between calls as often as you like. Each conversation is absolutely private. Cancel Call Waiting Now when you have a call that you don t want interrupted, you can prevent a second call from breaking into your line. All you have to do is activate Cancel Call Waiting prior to placing your call. 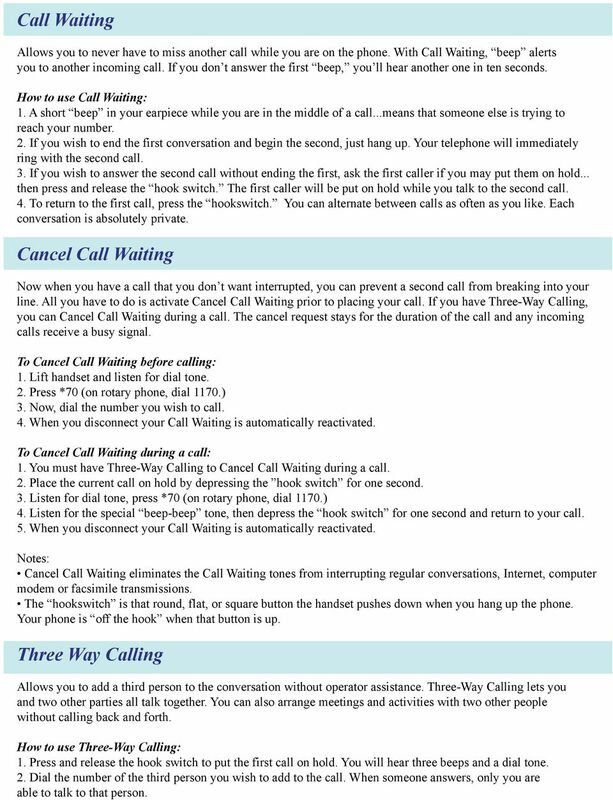 If you have Three-Way Calling, you can Cancel Call Waiting during a call. The cancel request stays for the duration of the call and any incoming calls receive a busy signal. To Cancel Call Waiting before calling: 1. Lift handset and listen for dial tone. 2. Press *70 (on rotary phone, dial 1170.) 3. Now, dial the number you wish to call. 4. When you disconnect your Call Waiting is automatically reactivated. To Cancel Call Waiting during a call: 1. You must have Three-Way Calling to Cancel Call Waiting during a call. 2. Place the current call on hold by depressing the hook switch for one second. 3. Listen for dial tone, press *70 (on rotary phone, dial 1170.) 4. Listen for the special beep-beep tone, then depress the hook switch for one second and return to your call. 5. When you disconnect your Call Waiting is automatically reactivated. Cancel Call Waiting eliminates the Call Waiting tones from interrupting regular conversations, Internet, computer modem or facsimile transmissions. The hookswitch is that round, flat, or square button the handset pushes down when you hang up the phone. Your phone is off the hook when that button is up. Three Way Calling Allows you to add a third person to the conversation without operator assistance. Three-Way Calling lets you and two other parties all talk together. You can also arrange meetings and activities with two other people without calling back and forth. How to use Three-Way Calling: 1. Press and release the hook switch to put the first call on hold. You will hear three beeps and a dial tone. 2. Dial the number of the third person you wish to add to the call. When someone answers, only you are able to talk to that person. 3 Three Way Calling continued 3. To begin the three-way call, press and release the hook switch. Now, all three of you are on the line. 4. If the line is busy or you get no answer, you can return to the original call by pressing and releasing the hook switch. 5. If the party you are talking to hangs up you can add another caller by repeating steps To disconnect the last party added, press and release the hook switch twice. Your line is then free to a different third party by repeating steps Three-Way Calling works whether you have received or made the first call. 8. Everyone is disconnected once you hang up. Call Forwarding You can transfer all of your calls to another phone so you won t have to miss important calls when you re someplace else. You control the forwarding of your calls to any number including your cellular or pager, anytime you choose. To activate Call Forwarding: 1. Press *72 (on rotary phone, dial 1172.) 2. Dial the number that will be accepting your calls. When someone answers the phone, Call Forwarding is working. Let that person know that they will be receiving your calls. 3. If the line is busy, or there is no answer, hang up and repeat the first two steps. You will hear two short tones. Call Forwarding will be working after the second try. To deactivate Call Forwarding: 1. Press *73 (on rotary phone, dial 1173). Listen for two beeps. Your phone will ring briefly each time your number is called. You cannot answer the calls. The ring is just a reminder that Call Forwarding is activated. You can still call out even with your incoming calls forwarded. Toll charges apply on long distance calls Call Forward Busy Allows you to automatically forward your calls to another number when your line is busy. How to use Call Forward Busy: 1. Press *90 (on a rotary phone, dial 1190.) 2. Listen for special dial tone. Enter the number to which the calls will be forwarded. When someone answers the phone, Call Forward Busy is active. 3. If the line is busy, or there is no answer, hang up and repeat the first two steps. You will hear two short tones. Call Forward Busy will be working after the second try. How to Cancel Call Forward Busy: 1. Press *91 (on a rotary phone, dial 1191). 2. Listen for two beeps, then hang up. 4 Call Forward No Answer Allows you to automatically forward your calls to another number when there is no answer after specified number of rings. How to use Call Forward No Answer: 1. Press *92 (on a rotary phone, dial 1192). 2. Listen for special dial tone. Enter the number of rings to be allowed (2-9) before the call is forwarded; then enter the number to which the calls will be forwarded. When someone answers the phone, Call Forward No Answer is active. 3. If the line is busy, or there is no answer, hang up and repeat the first two steps. You will hear two short tones. Call Forward No Answer will be working after the second try. To Cancel Call Forward No Answer: 1. Press *93 (on a rotary phone, dial 1193). 2. Listen for two beeps, then hang up. Call Forward Remote Access If you forgot to forward your calls before leaving your home or office, no need to worry. Call Forward Remote Access allows you to forward your calls from virtually any touch-tone phone, cellular or payphone. As your location changes, so can your call forwarding. To gain remote access for Call Forwarding: 1. Lift handset, and listen for dial tone. 2. Dial the dedicated access number provided by your local telephone company, including any prefix digits and area code that may be required. Dedicated access number: 3. Listen for the line to ring, then wait for the special dial tone. 4. Dial your ten-digit telephone number that has the Call Forwarding feature. 5. Immediately after completing the above step, dial your Personal Identification Number (PIN), given to you by your local telephone company. Your PIN number: 6. Listen for the special dial tone. You re now ready to activate or deactivate Call Forwarding. To activate Call Forwarding after gaining remote access: 1. Press * Dial the number where you want to forward your calls to. 3. Wait for confirmation tone, then hang up. To deactivate Call Forwarding after gaining remote access: 1. Press * Listen for two beeps, then hang up. To change the forwarded number, simply repeat the remote access activation steps. You don t need to deactivate the feature first. You must have a touch-tone phone to activate or deactivate Call Forwarding from a remote location. 5 Anonymous Call Rejection Allows you to reject callers who have chosen to block their number from being displayed on your Caller ID device. To activate Anonymous Call Rejection: 1. Press *77 (on rotary phone, dial 1177). Listen for confirmation tone. Hang up. To deactivate Anonymous Call Rejection: 1. Press *87 (on rotary phone, dial 1187). Listen for confirmation tone. Hang up. Callers who have blocked the display of their number will hear an announcement that you do not accept anonymous calls and they should remove the blocking and call again. All other calls will ring through as usual. Caller ID Caller ID allows you to view the number of the person who is calling. Caller ID Name & Number allows you to view the name and the number of the person or company trying to reach you. Caller ID requires a telephone with Caller ID display or a separate add-on display unit. Use Caller ID to: See who is calling before you answer the phone. Enhance security and help eliminate harassing calls. Store the numbers (and names if you subscribe to Caller ID Name) of people who have called you, even while you were out. Review the information later and return the calls at your convenience. How to use Caller ID: 1. Wait for the start of the second full ring of your telephone. 2. The number (and name if you subscribe to Caller ID Name) of the person/company calling will appear on your display unit. Caller ID on Call Waiting See who is calling while you re on another phone call. You can then decide whether or not to interrupt your current conversation. Save money by avoiding interruption of long distance calls to answer unwanted calls. Return calls you may receive while you re on the phone, rather than interrupt calls in progress. Enhance security & help eliminate harassing calls. How to Use Caller ID on Call Waiting: 1. You will hear two signals. First, you will hear the traditional Call Waiting beep that alerts you to an incoming call. Following that, you will hear a short tone which lets you know that Caller ID data is being downloaded to your display unit. 2. The calling party s number (and name if you subscribe to Caller ID Name) will appear on your display unit. Must have Caller ID on Call Waiting capability on your equipment to take advantage of this feature. 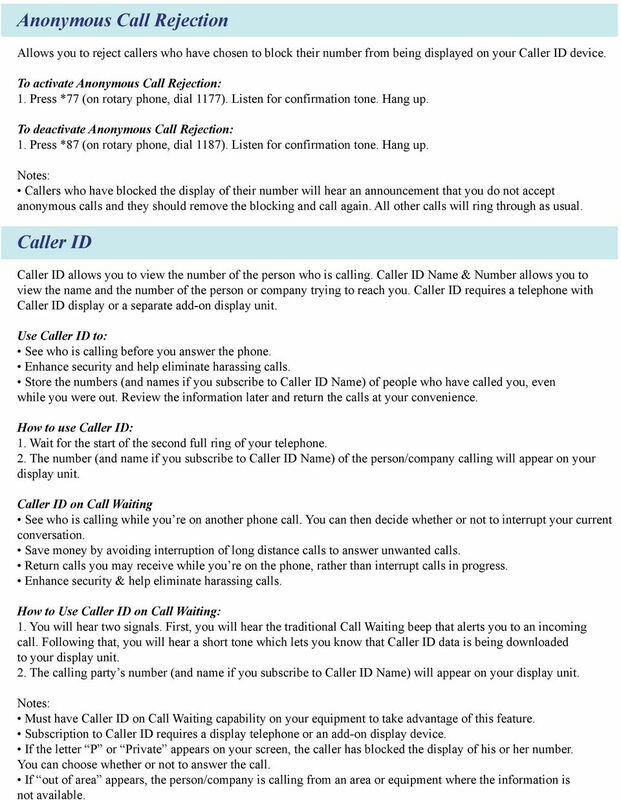 Subscription to Caller ID requires a display telephone or an add-on display device. If the letter P or Private appears on your screen, the caller has blocked the display of his or her number. You can choose whether or not to answer the call. If out of area appears, the person/company is calling from an area or equipment where the information is not available. 6 Caller ID Blocking Caller ID Blocking prevents your number from being shown on someone s Caller ID display. Caller ID Blocking is accomplished by entering a simple code which prevents your number from being displayed on an individual call basis. Caller ID Blocking through the telephone company prevents all calls placed from your number from being displayed. There is no charge for this feature. How to use Caller ID Blocking: 1. Press *67 (on a rotary phone, dial 1167). Dial the number you re calling as usual. 2. The person you ve called will not be able to see your number displayed on their display screen. Instead, a P or Private will be displayed. Press *67 (on a rotary phone, dial 1167) before each call you place. Otherwise, your phone number will be released to the person receiving your call. If you request Caller ID Blocking from your telephone company, you do not need to dial a code to block your number each time. Your number will always appear as Private. To turn off Caller ID Blocking (allowing your number to be displayed) on an individual call, press *82 (on a rotary phone, dial 1182) before placing the call. Automatic Callback Allows you to dial a code to have your phone keep trying a busy number up to 30 minutes. When the called party line is free, you will be alerted with a special ring, and automatically places the call when you pick up your phone. How to use Automatic Callback: 1. When you hear a busy signal, press and release the hook switch. Listen for a special tone. If you have already hung up, lift the handset and listen for normal dial tone. 2. Press *66 (on a rotary phone dial 1166). If the line is still busy, listen for an announcement telling you the number is busy. 3. Hang up. Your phone will check the number for up to 30 minutes. 4. A distinctive ring alerts you if the line becomes free. Lift the handset to automatically place the call. To cancel your Automatic Callback request: 1. Listen for Dial Tone. 2. Press *86 (on a rotary phone dial 1186). Listen for confirmation tone. Hang up. To start the 30-minute clock, repeat steps 1-3 under How to use. Does not work on 800 numbers, 900 numbers, or with calls originating from an area where this feature is not available, calls originating outside your LATA, or calls originating from some cellular phones. Toll charges apply on long distance calls. Automatic Recall Allows you to dial a code and have a call automatically returned to the last party who called or attempted to call you. How to use Automatic Recall: 1. Press *69 (on a rotary phone, dial 1169). A voice will give you the number of the call and ask if you wish to use Automatic Recall. Just follow the voice instructions. 7 Automatic Recall continued If the line is busy: 1. If the line is busy, hang up and your phone will keep trying the line for up to 30 minutes. 2. A distinctive ring alerts you if the line becomes free. 3. Lift the handset to automatically place the call. To Cancel Automatic Recall: 1. Press *89 (on a rotary phone, dial 1189). Listen for the confirmation tone or announcement. Hang up. Will provide you with the caller s number, but will not allow you to automatically call the number if outside of your LATA. Does not work on 800 numbers, 900 numbers, or calls originating from an area where this feature is not provided, or calls originating from some cellular phones. Toll charges apply on long distance calls. If the caller s number is Private the announcement will state this, but you can still use Automatic Recall. Call Trace If you are annoyed by nuisance calls, take charge. Call Trace enables you to initiate a trace on your last incoming call. Traced information will be provided only to law enforcement officials if you choose to prosecute. How to use Call Trace: 1. When you get a nuisance call, press and quickly release the hookswitch. Listen for a special dial tone. If you have already hung up, just lift the handset again and listen for normal dial tone. 2. Press *57 (on a rotary phone, dial 1157), you will hear an announcement that the call can be traced. Just follow the voice instructions to dial an additional code, and the call will be traced. 3. Listen for the confirmation announcement that the last call has been traced. Hang up. 4. The number you traced will be recorded at the telephone company. If you wish to follow up the matter, contact the telephone company to let them know the call has been traced. Call trace must be used immediately after you hang up on the call you want to trace. 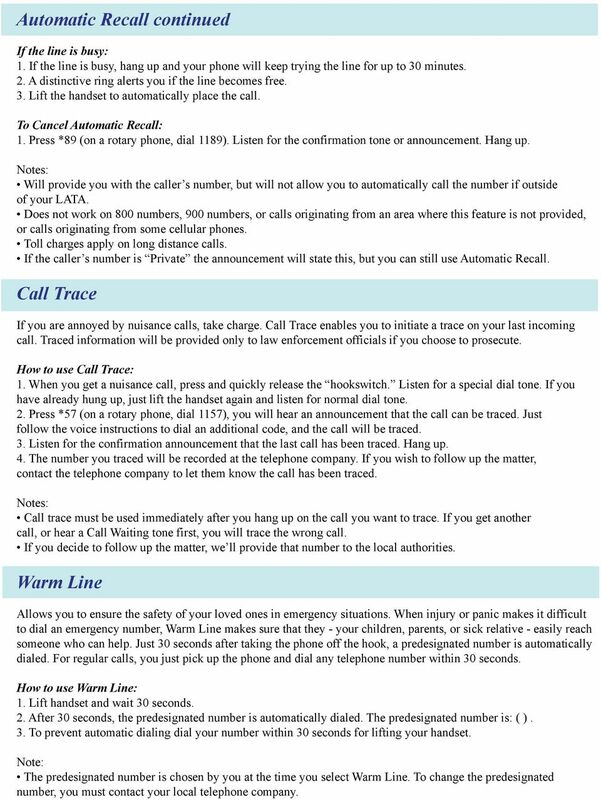 If you get another call, or hear a Call Waiting tone first, you will trace the wrong call. If you decide to follow up the matter, we ll provide that number to the local authorities. Warm Line Allows you to ensure the safety of your loved ones in emergency situations. When injury or panic makes it difficult to dial an emergency number, Warm Line makes sure that they - your children, parents, or sick relative - easily reach someone who can help. Just 30 seconds after taking the phone off the hook, a predesignated number is automatically dialed. For regular calls, you just pick up the phone and dial any telephone number within 30 seconds. How to use Warm Line: 1. Lift handset and wait 30 seconds. 2. After 30 seconds, the predesignated number is automatically dialed. The predesignated number is: ( ). 3. To prevent automatic dialing dial your number within 30 seconds for lifting your handset. Note: The predesignated number is chosen by you at the time you select Warm Line. To change the predesignated number, you must contact your local telephone company. 8 Selective Call Forwarding Allows you to create a list of phone numbers that are to be forwarded when they call you. You select and program the calling phone numbers you want forwarded and the destination number to which they are forwarded. When the feature is active, calls from numbers on your list will be forwarded to your forward-to number. All other calls will ring your phone. How to use Selective Call Forwarding: 1. Press *63 (on a rotary phone, dial 1163). 2. Listen for an announcement telling you whether the feature is currently on or off. A pre-recorded voice will tell you how many (if any) numbers are currently stored in your list. 3. Listen to the voice instructions which will guide you through the steps of how to: * Turn Selective Call Forwarding On or Off. * Make changes to your Selective Call Forwarding List. The list you create here is separate from any other lists you may be using for Selective Call Acceptance, Selective Call Rejection, Selective Distinctive Ring, and similar services. This service can work with Call Forward. Numbers on your preferred list will follow you to your Selective Call Forward number. All other calls will be routed to your regular Call Forward number. Toll charges apply on long distance calls. Selective Call Forwarding does not work if the caller s number is outside of your LATA. Selective Distinctive Ring Allows you to program your telephone line to ring with a special ringing pattern whenever you are called from a select list of phone numbers. Your phone will ring with a normal ringing pattern for all other calling numbers. If you also have Call Waiting, you will hear a distinctive Call Waiting tone whenever someone on your list calls while you are on the phone. How to use Selective Distinctive Ring: 1. Press *61 (on a rotary phone, dial 1161 ). 2. Listen for an announcement telling you whether the feature is currently on or off. A pre-recorded voice will tell you how many (if any) numbers are currently stored in your list. 3. Listen to the voice instructions which will guide you through the steps of how to: * Turn Selective Distinctive Ringing On or Off. * Make changes to your Selective Distinctive Ringing List. The list you create here is separate from any other Acceptance, Selective Call Rejection, lists you may be using for Selective Call, Selective Call Forwarding, and similar services. 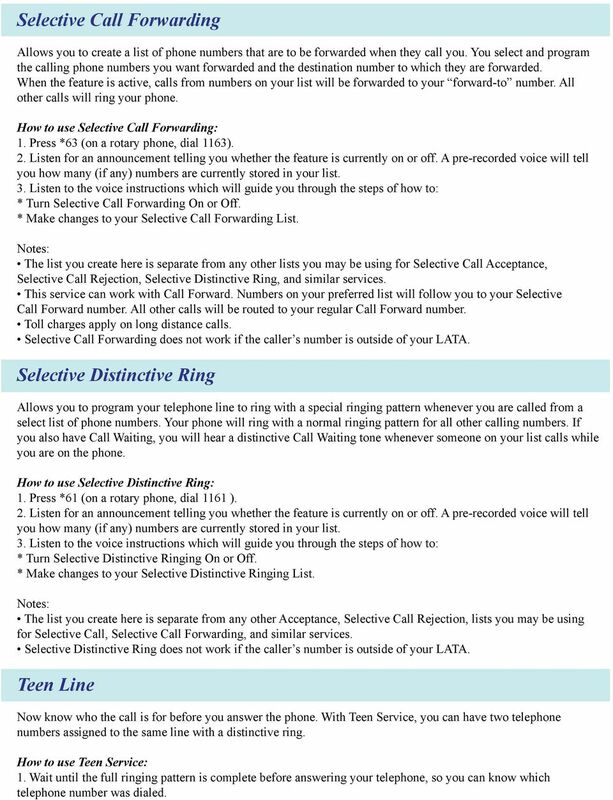 Selective Distinctive Ring does not work if the caller s number is outside of your LATA. Teen Line Now know who the call is for before you answer the phone. With Teen Service, you can have two telephone numbers assigned to the same line with a distinctive ring. How to use Teen Service: 1. Wait until the full ringing pattern is complete before answering your telephone, so you can know which telephone number was dialed. 9 Teen Line continued (Main Telephone Number) RINGING One long ring (Normal ring) (Secondary Telephone Number) RINGING Two short rings How to use Teen Service with Call Waiting: If you have Call Waiting with Teen Service the same distinctive ringing patterns are used with Call Waiting tones. This allows you to determine whether or not to interrupt your current conversation to answer the incoming call. 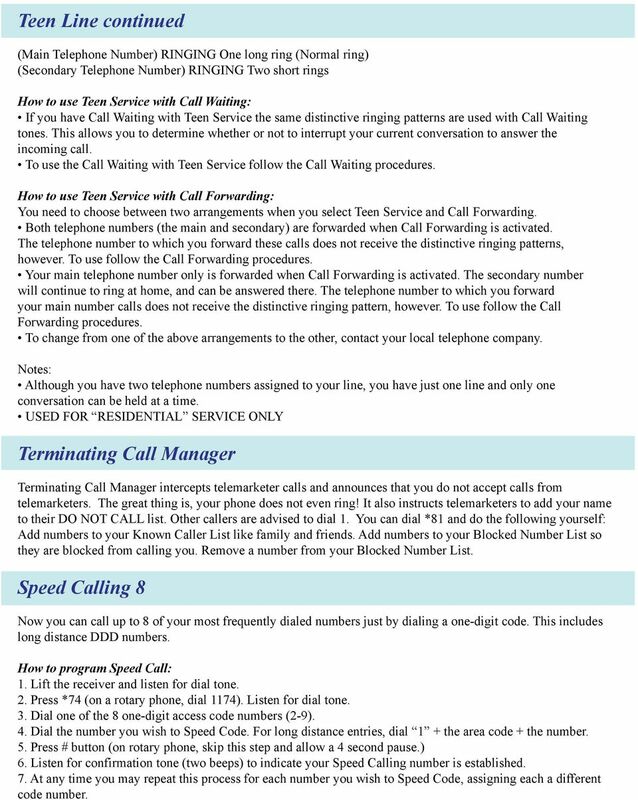 To use the Call Waiting with Teen Service follow the Call Waiting procedures. How to use Teen Service with Call Forwarding: You need to choose between two arrangements when you select Teen Service and Call Forwarding. Both telephone numbers (the main and secondary) are forwarded when Call Forwarding is activated. The telephone number to which you forward these calls does not receive the distinctive ringing patterns, however. 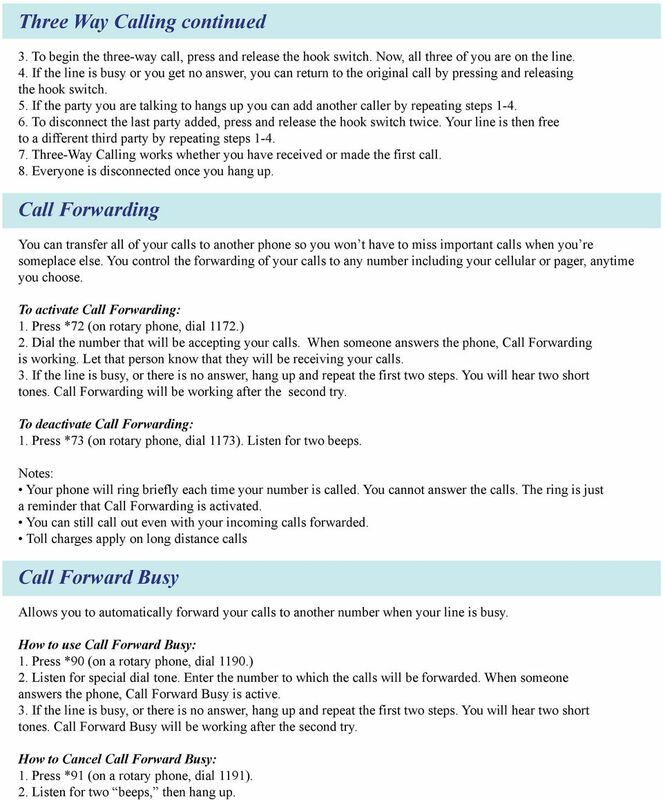 To use follow the Call Forwarding procedures. Your main telephone number only is forwarded when Call Forwarding is activated. The secondary number will continue to ring at home, and can be answered there. The telephone number to which you forward your main number calls does not receive the distinctive ringing pattern, however. 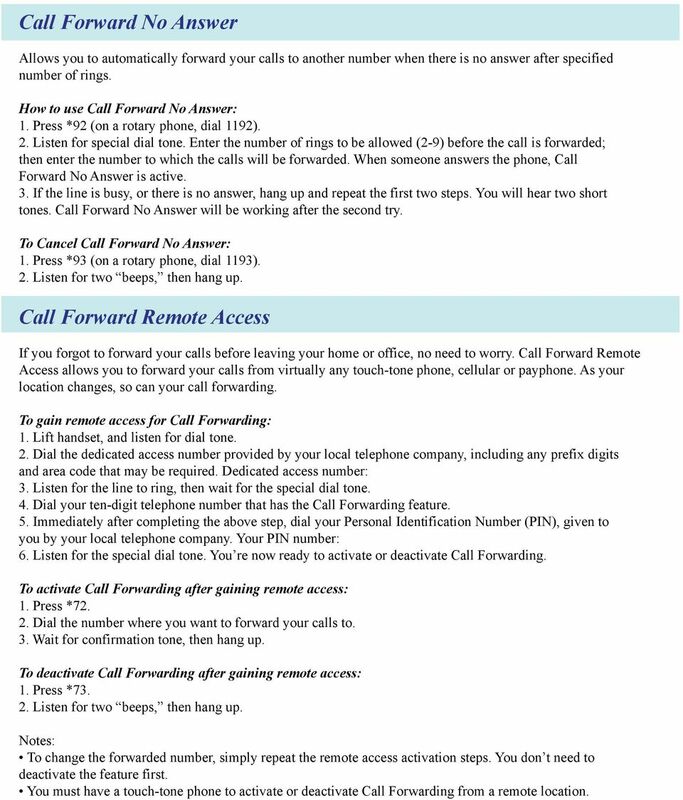 To use follow the Call Forwarding procedures. To change from one of the above arrangements to the other, contact your local telephone company. Although you have two telephone numbers assigned to your line, you have just one line and only one conversation can be held at a time. USED FOR RESIDENTIAL SERVICE ONLY Terminating Call Manager Terminating Call Manager intercepts telemarketer calls and announces that you do not accept calls from telemarketers. The great thing is, your phone does not even ring! It also instructs telemarketers to add your name to their DO NOT CALL list. Other callers are advised to dial 1. You can dial *81 and do the following yourself: Add numbers to your Known Caller List like family and friends. Add numbers to your Blocked Number List so they are blocked from calling you. Remove a number from your Blocked Number List. Speed Calling 8 Now you can call up to 8 of your most frequently dialed numbers just by dialing a one-digit code. This includes long distance DDD numbers. How to program Speed Call: 1. Lift the receiver and listen for dial tone. 2. Press *74 (on a rotary phone, dial 1174). Listen for dial tone. 3. Dial one of the 8 one-digit access code numbers (2-9). 4. Dial the number you wish to Speed Code. For long distance entries, dial 1 + the area code + the number. 5. Press # button (on rotary phone, skip this step and allow a 4 second pause.) 6. Listen for confirmation tone (two beeps) to indicate your Speed Calling number is established. 7. At any time you may repeat this process for each number you wish to Speed Code, assigning each a different code number. 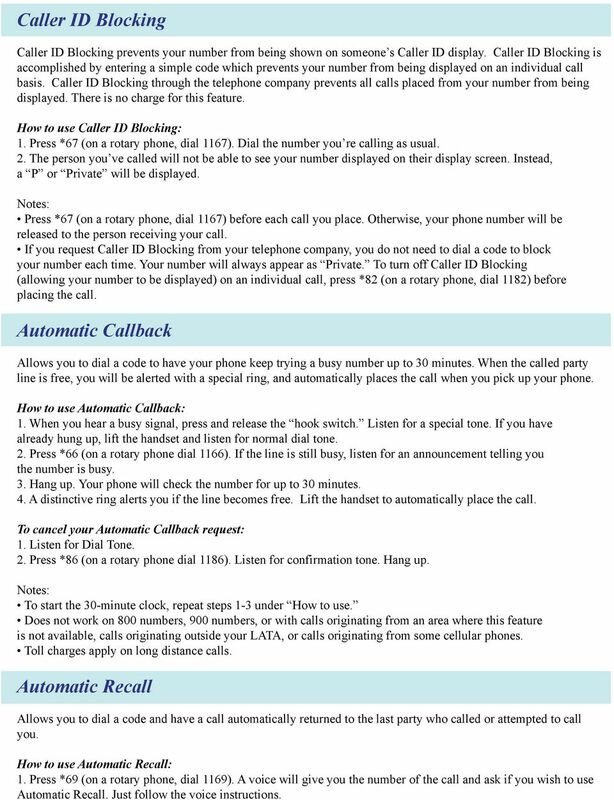 10 Speed Calling 8 continued How to use Speed Calling 1. Lift the receiver and listen for dial tone. 2. Dial the appropriate one-digit access number (2-9). 3. Press the # button (on a rotary phone, skip this step and allow a 4 second pause for your number to be connected). 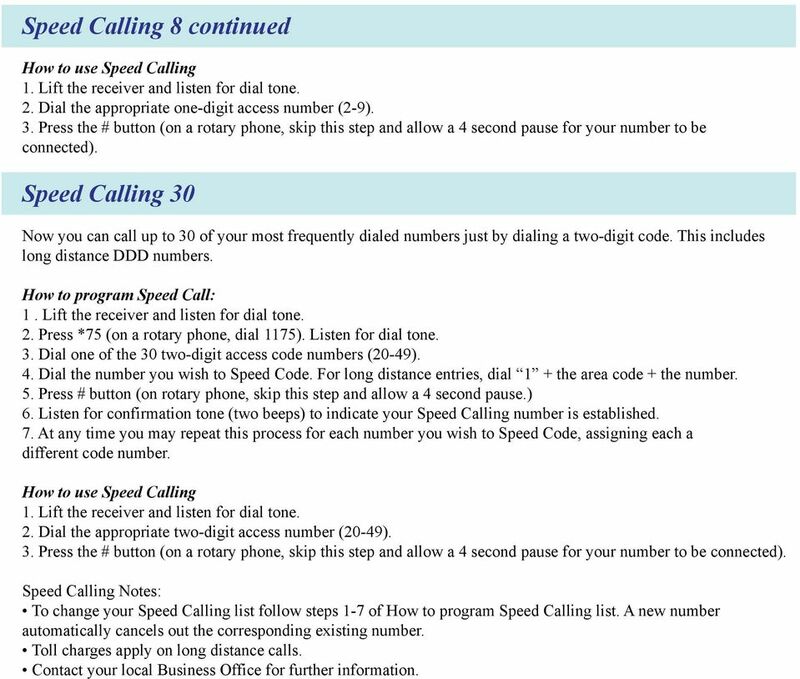 Speed Calling 30 Now you can call up to 30 of your most frequently dialed numbers just by dialing a two-digit code. This includes long distance DDD numbers. How to program Speed Call: 1. Lift the receiver and listen for dial tone. 2. Press *75 (on a rotary phone, dial 1175). Listen for dial tone. 3. Dial one of the 30 two-digit access code numbers (20-49). 4. Dial the number you wish to Speed Code. For long distance entries, dial 1 + the area code + the number. 5. Press # button (on rotary phone, skip this step and allow a 4 second pause.) 6. Listen for confirmation tone (two beeps) to indicate your Speed Calling number is established. 7. At any time you may repeat this process for each number you wish to Speed Code, assigning each a different code number. How to use Speed Calling 1. Lift the receiver and listen for dial tone. 2. Dial the appropriate two-digit access number (20-49). 3. Press the # button (on a rotary phone, skip this step and allow a 4 second pause for your number to be connected). Speed Calling To change your Speed Calling list follow steps 1-7 of How to program Speed Calling list. A new number automatically cancels out the corresponding existing number. Toll charges apply on long distance calls. Contact your local Business Office for further information. Welcome to Earthlink Business Thank you for selecting us to provide your business communications. This guide is formatted to help you get the most from the Earthlink Business products you have selected. LIST OF EFFECTIVE SHEETS. Sheets listed below are effective as of the date shown on each sheet. Single-Line Telephone Set Feature Instructions FLASH, RECALL, TAP, & R buttons all perform the same function. Any single-line set without one of these buttons will need to use the switch hook button instead.